Kickstarter of the Week: Clear the Decks! Naval warfare has never been so exciting. In Clear the Decks! players are working together battling an enemy ship with their own navel ship and crew. Clear the Decks is designed by Christopher Pinyan of Crispy Games Co. The Engaged Family Gaming team has had the pleasure to see Clear the Decks evolve over the past year. Our first look at this game was at the 2017 Connecticut Festival of Independent Games. 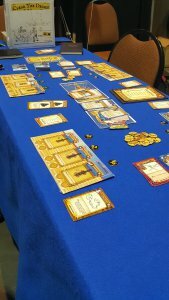 Clear The Decks was again at the 2018 Connecticut Festival of Independent Games. Clear the Decks! is a 1-4 player cooperative card game depicting ship to ship combat in the age of fighting sail. For ages 10 and up. On the high seas, you have met your enemy. By yourself or with shipmates, you each have 3 gun crews using different ammunition, tactics, officers, and marines to attack the enemy ship’s guns, crew and structures. Can you smash enough leaks in the enemy ship before they have destroyed all of your cannons? It’s time to beat to quarters and Clear the Decks! The Kickstarter went live on July 17, 2018, and runs through August 16th. All the line art for the game is complete. We have a couple weeks’ worth of coloring still to do and will provide updates over the course of the campaign. Some of the stretch goal cards are already designed and just waiting for enough funding to include them in the game. We estimate that by end of August we will be ready to send to printer for production review. The closest I would consider is Castle Panic. It is also cooperative (though there still is a “winner”), there is the concept of impending danger and you have to come up with certain combinations of card and location in order to attack your target. The movie Master and Commander was always a favorite. I got hooked on reading the book series, which then led to reading several non-fiction books on the US and British navies during the late 17 and early 1800’s. Reading through the sea battles, watching them in the Horatio Hornblower series on BBC made me of puzzle combinations – which cannon, which ammunition, which part of the ship, all the other issues to deal with during a battle and all of the different people on a ship – with different roles and how they all had to work together to be successful. That sounded like a great game to me. It had to be co-op and I didn’t want semi-co op where people are working together but ultimately still looking out for themselves to the possible detriment of the team. I love to see families sit down and work together, sometimes the parents coaching the kids, but plenty of times the kids getting excited and telling mom or dad what they should do. I loved the theme and it made designing now promoting the game fun. Sprinkling in a little history to maybe get people interested in reading up on the time period is a possible bonus. Reading and taking notes on gun sizes, the different ammunition types and what they were used for. Lots of notes on the different parts of a ship. Reading about the different other things – good and bad – that might randomly happen during a battle lead me to create Event and Fortune cards. Tricks of combat became player tactics cards and of course – all the different people became Crew cards. Then allowing myself some creative license to be less restrictive on what combinations would be allowed to attack certain cards. Some mathematics to determine a good ratio of certain cards in the game (Round shot vs Chain shot for example). Then on to gameplay – lots of testing and making sure the tension remains to the end and putting in some resource management requirements – saving the right cards for the right part of the game, but keeping the temptation there to get the unwary to use them at the wrong time and jeopardize a victory. Wanting the game available as a solitaire, and for younger and older families generated the concept of different sizes and difficulties of the ship – making lots of opportunities for interesting play among different age groups. Work together for a change! Show how teamwork and giving can help everyone succeed together. Can’t we ALL be happy and have fun on family game night? If we do – then maybe getting people interested in another family game night is easier. This is a way to get kids interested in this topic. It may put them down the path to developing their own reading habit. This was not the original goal of the whole game process, but if happens to be an unintended side effect – great. About 2 and a half years. Around Feb 2015 when I started evolving the mechanics of an earlier game I was working on for 18 months previously into this one. Number one is time! With a day job and two teenagers its tough to get even an hour of uninterrupted time to focus on something. On a personal level, getting outside the comfort zone. First, to go out and show it to playtesters. Then take the feedback of something you worked so hard on – without taking offense. That is a real personal growth opportunity. Blank cards I ordered online that I drew on with markers. On the back, I got a tall ship ink stamp from a scrapbooking friend and red and blue ink pads for the two card types. I grew up playing games – at home, at the park during the summer. I discovered local game conventions and once the indie game craze started – I thought I could do it. Clear the Decks is driven by theme, and the theme is driven by my passion for it. I worked in a lot of little details that I love to share during demos. I hope people will discover on their own as the play the game. Inspiring people to search for a couple of my references, maybe more people become interested in an amazing period and some amazing people in history. or by following me on Instagram and Facebook at Crispygamesco. Summer has just begin, and Christmas is the last think on our minds. 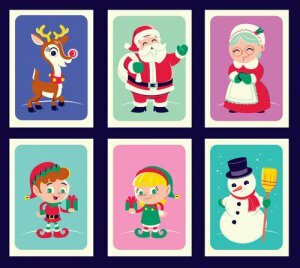 It is time to think cool, plan ahead, and check out Christmas Lights Card Game, a holiday-themed set collection game. It has the 9 additional bonus games that can be played using the cards. The game is currently live on Kickstarter, and runs until June 27th. The cost for one copy is $15 and the shipping in the U.S. is only $2. The game is for 2-6 players and is recommended for players age 6 and up. It’s the most wonderful time of the year, Christmas! 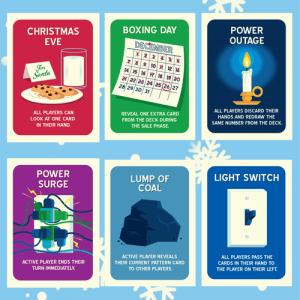 Players will swap, play, trade, and draw Christmas Light Bulbs into their own sets of lights as they race to be the first to complete two strands. 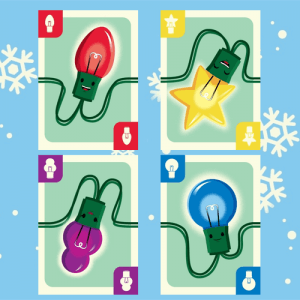 Christmas Lights Card Game features art by Dave Perillo and was designed by Adam Collins and Chad Head. We went live Tuesday May 29th and were quite excited to see us fund in under 8 hours! The campaign runs until June 27th. The game is complete and will be ready to go to production shortly after the Kickstarter campaign concludes. It gets a lot of comparisons to a competitive version of Hanabi, mainly because players hold their cards facing outward. Each player cannot view their own hand, but can see all of the cards other players are holding. I love the Christmas season. I’m one of those people who decorate their house right after Halloween and keeps it up through mid January. When I saw the design that Adam Collins and Chad Head made with Christmas Lights, I just had to contact them about partnering up with me to publish their game. The game was largely complete when I brought it on board. One of the first things we did was start to trim down the card counts by making a few modifications. Next I wanted to create a little more player interaction, so I worked with Adam and Chad H. to add more variability with the wild and event cards. Value and variety. For what is a very reasonable price point, you can play 10 different games with a variety of player counts and ages. I started with working with Adam and Chad H. back in February to get the game ready to launch on KS in late May. I would say time was really the biggest obstacle. We had a lot to do in a very short window of time in order to bring this game to KS early enough in the year to give us the runway to fulfill it to backers by the holidays. When I signed the game, they already had some placeholder art for the game. I wanted to give it a retro vintage styling with a modern touch. I’ve been a fan of Dave Perillo’s artwork for some time and he has that look to the work he creates. I was fortunate to have him work on the project and it looks drastically different from when the game was first signed from the designers. I’m a board gamer first and foremost. I love playing all kinds of tabletop games. As such, I approach every new game project with the same enthusiasm and passion for creating something I can be proud to put on the table. 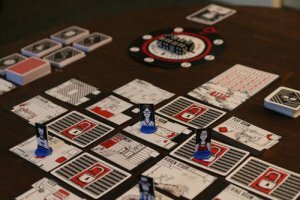 This is my fourth tabletop project, having published two puzzles and one prior game. I am currently working on art development for the next game 25th Century is going to publish in Q4 called “Winner Winner Chicken Dinner.” I also have two additional game designs from different designers for 2019 that will begin development efforts soon. On Their Merry Way is a Robin Hood themed game we first saw at the Boston Festival of Independent Games (BFIG). On Their Merry Way is a path building game for 2-5 players ages 13+ that takes roughly 45 to 60 minutes. On Their Merry Way is a unique path building game for 2-5 players, who take on the role of Robin Hood’s Merry Men, setting traps along the trails of Sherwood Forest and trying to fool the wealthy merchants during their travels. When is your Kickstarter live? On Their Merry Way is in the final prototyping stages and will be in production as soon as it reaches its funding goal. On Their Merry Way is a one of a kind game that stands alone in the tabletop community. Some have compared it to tower defense style games but its unique path building mechanic is completely new. At New Experience Workshop we strive to make games we want to play that don’t yet exist. On Their Merry Way is a completely unique experience that is fun and strategic in its own way. We were inspired by the Tiny Epic model’s use of a low component count, three types of resources and a rich selection of choices to be made. However, as On Their Merry Way came to be, it developed into an entirely unique game that broke that mold and forged its own. It’s a new type of challenge that provides something for all age levels. It provides a new challenge for older players who will enjoy figuring out the puzzle of path building, but provides equal footing for younger players as it is a completely new genre of game for everyone. We struggled at first to find balance in all the moving parts of the game, but as we cut away some of the superfluous parts and got to the core of the game, we found that while certain aspects were fun in their own right, they added more complexity than necessary and ultimately detracted from the main experience. Our first prototype was themed around the hay-day of Route 66 travel and featured cars in the traveler positions and roadside attractions in place of traps. I feel fulfilled when I’m making games. Games provide a shared social construct for people to interact and have a good time, which I feel is more and more important in our ever-technologically involved world. We are a two-person team working as hard as possible to bring our games to the world and share our joy with as many people as possible! Dobbers: Quest for the Key is an encounter building, deck building, strategy game that is currently live on Kickstarter. It was designed and is being brought to Kickstarter by Darryl Jones. He took the time to answer some questions for us about his campaign. Take a look below and check out the campaign! Dobbers: Quest for the Key is a whimsical, high-fantasy, family game for ages 8 and up. It is a 2-4 player game, which usually takes about an hour to play. Dobbers: Quest for the Key is a whimsical, family friendly board game for 2-4 players. It is an encounter building, deck building, strategy game. Create surprise encounters for your opponent while building your deck and equipping your hero. The mechanics are simple enough for children to enjoy with engaging strategies for adults. It has a high fantasy theme, with comic-book style, bold illustrations. There are two basic strategies essential to winning the game: Placing challenging encounters on the board, preventing other players from being able to advance along their chosen path. Equipping your hero and building up your personal deck so that you can more easily overcome any encounters that have been placed along your path. The game mechanics and testing are complete. There will be refinement with Kickstarter feedback of course, and there is still quite a bit of illustrations to complete for cards. 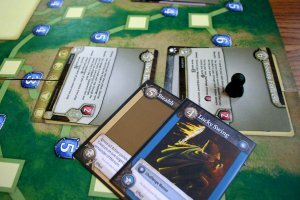 Clank and Legendary are both deck builders that use a game board, but I’ve not seen any other deck builder that allows you to build encounters for your opponents. I believe it’s a very unique process. When I was younger, my Grandpa would say, “Keep your dobbers up!” when I felt down. I never really knew what a Dobber was, so I decided to create them. Inspired by the legends of fantasy creators, they became little gnome-like creatures living in the forest. Later, I decided to write and illustrate a comic book. I self published it in 2001. My career as a designer took over shortly after that, and it sat dormant for a while. Marriage, kids, work, all those things progressed. A few years back I got into gaming in a big way once again. I wanted more games that could “thread the needle” between challenging strategy and young player engagement. The Dobbers never left the back of my mind. I started talking about it with my son and inspiration struck! We were going to make a board game! I focused on mechanics and design while he helped flesh out a lot of theme ideas. He also had a lot of input on what would make the game fun for him. There’s a lot of story involved, though all of it may not come out in our first board game, the story will unfold as we publish more games in the series. It started with index cards for the cards and graph paper for the board. Next I laid out a card template in Illustrator, printed and cut out a bunch. There were blank spaces for each of the stats needed, so I could fill them out, test, replace and do it all again. This made for a quick way to iterate testing and balancing. Slowly I began working on illustrations, icons and other common design elements that would be necessary. All the while, continuing to test and brainstorm with my son. After a few months, we got our first set of cards printed at Staples. They looked pretty bad. My colors were too dark and the difference in groups were too subtle. I redesigned the borders, frames and color schemes. 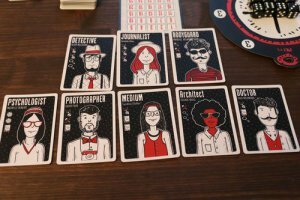 We took it to GenCon in 2017 to play test with strangers. It went really well. Almost all positivist feedback. I’ve done a little more refinement on the frames and other common elements. Now, in addition to finishing illustrations for the individual cards, I’m working on graphics for the rules, promotional items and box. I expect the process will go through another round of refinement as I get feedback and suggestions from the Kickstarter community. As mentioned before, the goal was to create a game that was engaging for kids, but still something an adult could sink their teeth into. I think we’ve done that. Kids will enjoy the art and be swept away by the idea of equipping their hero while putting cool monsters in front of their opponent. Younger kids will get to practice basic addition and subtraction. My hero’s = 1 +1 for her sword +1 for her armor and she is facing a location that totals 4, who wins? And adults will enjoy finding the perfect card combination to over come even the most challenging encounter. It’s got it all! For Dobbers: Quest for the Key, I am the Game Designer, Graphic Designer, Illustrator, R&D, Marketing, Web Development and everything else guy. Wow, there is so much to do! Apparently most people have a team to publish a game. I completely underestimated it all. I expect to have a little more help for my next game. I’ve found that the number of individual illustrations to create is a huge time investment. I might have changed a few concepts earlier if I thought there was a way to make some illustrations reusable. I’ve been a gamer of all kinds since the mid 80’s. It’s been my goal to be a published creator since high school. I let that goal lie dormant for a while, but now I’m glad to have it back as a passion. A little more about me in the gaming industry. I’ve done a lot of behind-the-scenes work. Now it’s time to move a little more into the forefront. I was the designer and illustrator for a lot of classic Dwarven Forge resin sets, Realm of the Ancients, Den of Evil, the Medieval Building set and more. I Illustrated all of the walls and other assets needed for True Heroes. A True Dungeon event was sponsored by Upper Deck at GenCon several years ago. I continue to work with Jeff on True Dungeon and have designed the logos and ads for TD for the last 10 years. I run a D&D 5 game on the ExplodingDice channel based in the world I created in 2001, the Dobbers. And the big one – I have a board game coming to Kickstarter also in the world of the Dobbers on April 16th. You can contact me here: darryl@splatteredink.com. I share much of my illustration on these social media platforms, including streaming my illustration process on twitch. The official website can be found at splatteredink.com and dobbersquest.com. Hello and Welcome to Engage! : A Family Gaming Podcast! This is episode 121. This week we are talking video games. Carla Kopp, CTO from Weird Giraffe Games! The topic of the week was Fire in the Library! Its a board game currently on Kickstarter from Carla’s company!